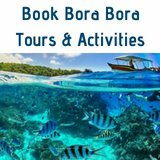 The following Bora Bora excursion tips will help ensure your have the most fun on your Bora Bora vacation. 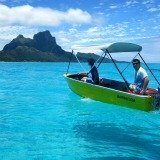 During your vacation in Bora Bora you must indulge in at least one lagoon tour. 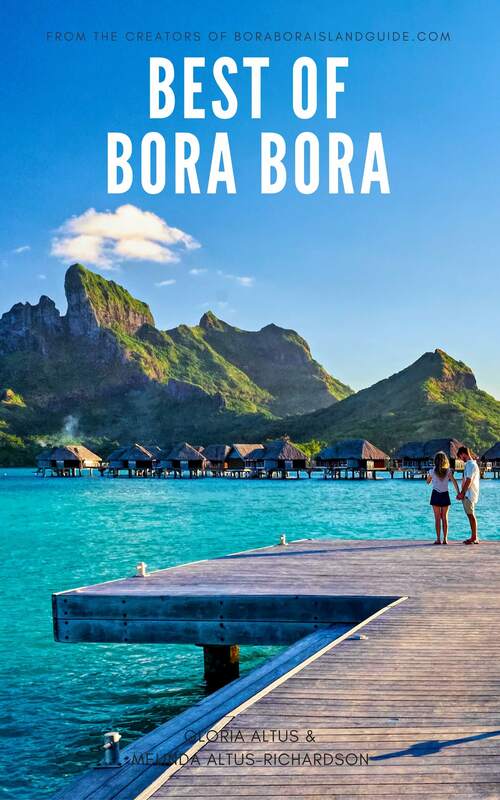 We cherish our picture postcard Bora Bora vacation memories. 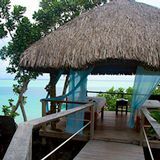 Which include sensations of being in calm, warm water surrounded by 360 degrees of sensational blues! We also know that the scenery below the water can be even more spectacular than that above! 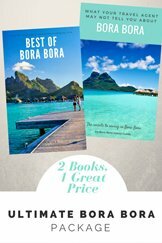 Read how my mum, Gloria, fell in love with Bora Bora snorkeling the first time she put on goggles to look under water. Ask your guide if he can take you through the pass to the royal blue ocean outside the reef. 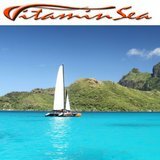 The deep, transparent water allows you to gaze way into the distance, and spot some of marine life that you would see on a Bora Bora dive. 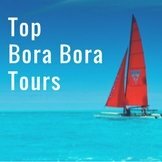 Bora Bora tours are fantastic in a group. And if you have the money it’s worth paying the price for a private excursion. 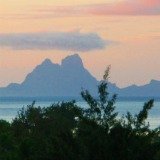 The cost reflects the island’s remoteness. Which is why it’s legendary beauty remains intact. 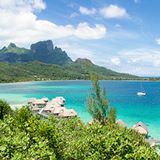 Consider that this may be your once in a lifetime opportunity to scoot around the lagoon of what, year after year, is voted ‘the most beautiful island in the world’! You will replay your stunning, inner movies the rest of your life. 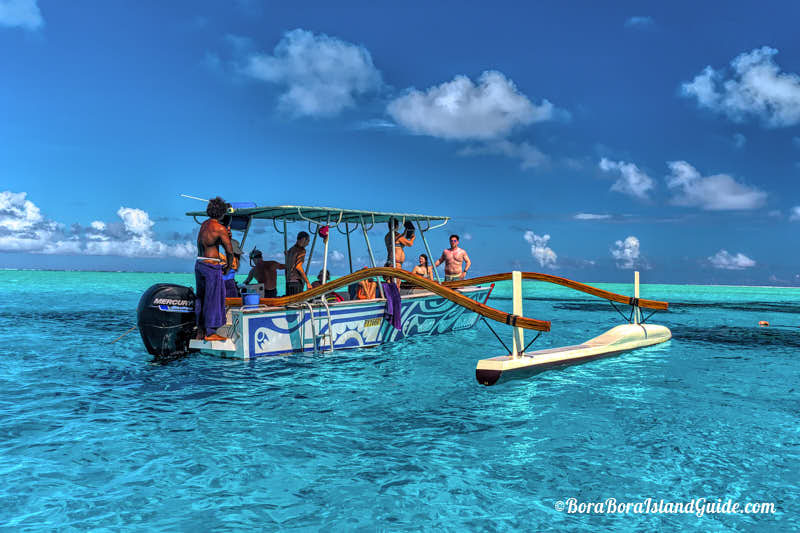 By pre-booking Bora Bora excursions online you can save almost 30% on the excursion cost. 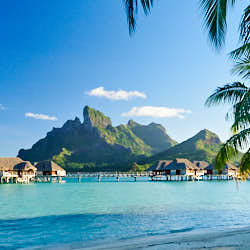 Purchasing online costs significantly less to purchasing tours through your resort's concierge. 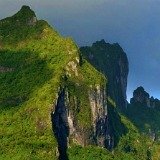 Resorts add 10-30% on top of the cost of the excursion. 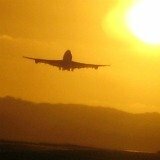 Confirm your excursion the day before through email or ask the concierge at your hotel to call for confirmation. There is nothing worse than getting up early, rushing breakfast and sitting at the dock waiting for an excursion provider that never shows. We know...it has happened to us! Even if you have confirmation of the tour being booked, we recommend you always reconfirm the day before. 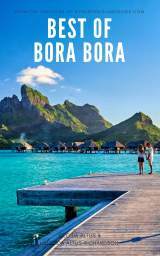 Bora Bora resorts favor certain excursion providers for more reasons than that they provide a good service. 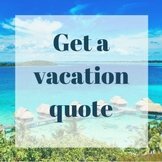 Rumors are that there are deals between the resort's concierges and certain tour providers in return for guaranteed business. 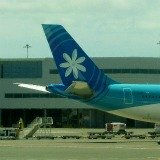 Be aware that you can choose any tour provider, not only the ones listed in the activities book a your hotel. 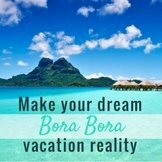 Of course you can get recommendations from the concierge if you haven't had time to do your own research on best Bora Bora tours before hand. This is a little tip but essential for ladies. Be prepared for your hair! 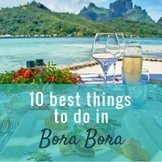 Always take a hair tie with you on Bora Bora excursions. It can be windy on the lagoon so you might even bring a scarf or a hat that will keep your hair under control. Make sure your hat is one that can withstand the wind. I have two great hats from Seafolly that have an elastic band at the back of them so you can tie them around your pony tail and your hat will never blow away. A hair tie is essential for when using a snorkel too. 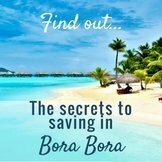 Want more tips for Bora Bora? We understand that it's hard to make decisions when creating a vacation as special as this one, especially when it's your first visit. Don't make the mistake of organizing, or going on your vacation, before reading it!